Climbing ropes require minimal space to provide excellent upper body strengthening and conditioning. They're also an excellent tool with which to develop arm coordination skills useful in gymnastics, wrestling and other sports. Includes climbing rope, top fitting, shackle and heat shrink tubing on ends. Intended for indoor use only. 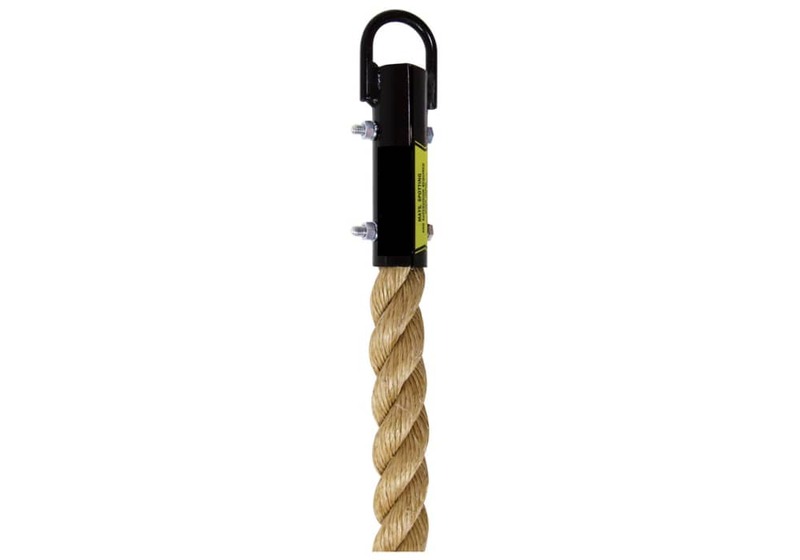 Unmanila Climbing Ropes: A specially manufactured 1-1/2" diameter polypropylene unmanila rope looks and feels like natural fiber rope at 2/3 the weight of manila. Surface texture enables good grip. Particularly popular at elementary level. Includes climbing rope, top fitting, shackle and heat shrink tubing on ends. All of our climbing ropes are intended for indoor use only. Manila Climbing Rope: Traditional 3-strand 1-1/2" diameter pure manila rope is extremely durable and absorbs perspiration for excellent grip. Unmanila Rope: A specially manufactured 1-1/2" diameter polypropylene unmanila rope looks and feels like natural fiber rope at 2/3 the weight of manila. Surface texture enables good grip. Particularly popular at elementary level. Poly Plus Rope: Extremely soft 1-1/2" diameter polyplus rope combines extra strong lightweight polypro core with a soft yet durable polyester outside jacket layer that's similar to the feel of cotton. Climbing ropes are made-to-order. Please allow approx. 2-3 week for delivery. Traditional 3-strand 1-1/2" diameter pure manila rope is extremely durable and absorbs perspiration for excellent grip. Specially manufactured 1-1/2" diameter polypropylene climbing rope looks and feels like natural fiber rope at 2/3 the weight of manila. Surface texture enables good grip. Particularly popular at elementary level. Extremely soft 1-1/2" diameter PolyPlus Rope combines extra strong lightweight polypro core with a soft yet durable polyester outside jacket layer that's similar to the feel of cotton.